Thundershirt Behavior Modification Shirt For Dogs - Large - Pink is the proven solution for dog anxiety. Thundershirt Behavior Modification Shirt For Dogs - Large - Pink is the proven solution for dog anxiety. 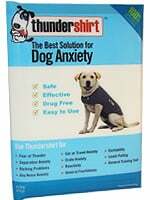 Thundershirt uses gentle, constant pressure to calm your dog, effectively aiding anxiety, fearfulness, barking and more. Thundershirts create gentle pressure that has a dramatic calming effect. XXS 9"-13" < 7 lbs. XXL 37"-50" > 110 lbs.